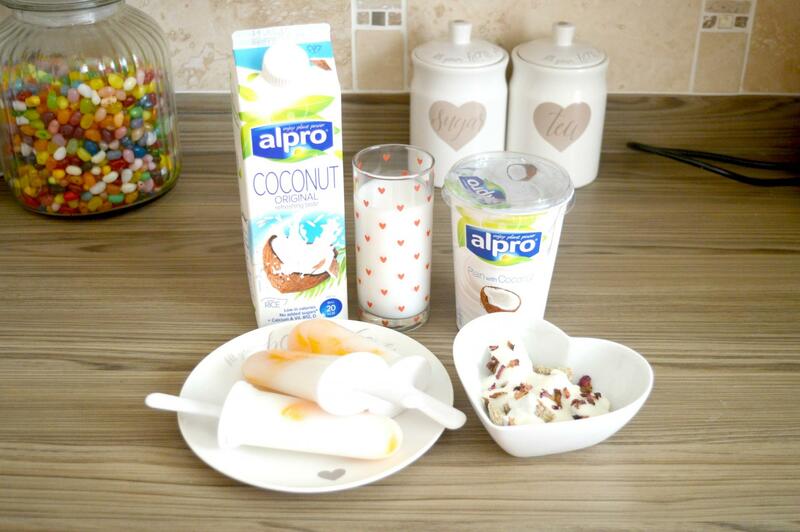 Recently I was contacted and asked if I would like the try out some products from the Alpro Coconut Range. As someone who has tried and enjoyed a number of Alpro products in the past, I jumped at the chance. In the hamper, I received two products from the brand. The first product I received was the Alpro Plain with Coconut Yogurt Alternative. The second product I received was the Alpro Coconut Original Drink. Now if you’re not aware Alpro specialise in plant-based products. They are a brand with a vision of a world where more of what we eat comes directly from plants. They originally began over 30 years ago by creating plant-based alternatives to milk, yogurt, meat, cream and margarine. Nowadays their range has expanded with new products being added to their ever growing list. One of my personal favourites from the brand is the Smooth Chocolate Soya Dessert. This tastes just like creamy melted chocolate. Another product I love is the Velvet Vanilla Soya Dessert. This is the perfect alternative to custard. In fact, I’d even go as far as saying I prefer this to non-plant-based custard. I’ve had various people try Alpro based products out and one thing is always said: “I cannot believe that is plant-based and has no animal product in it!” “How is that so creamy? It MUST contain proper cream!” I know I myself couldn’t believe how great Alpro products were when I first gave them a try but honestly, they’re fantastic. Anyway, back to the products I was recently sent. Both products are plant-based. Therefore they are suitable for both vegetarians and vegans. Both products are also flavoured with coconut, so they’re ideal for getting you in that Summer mood. 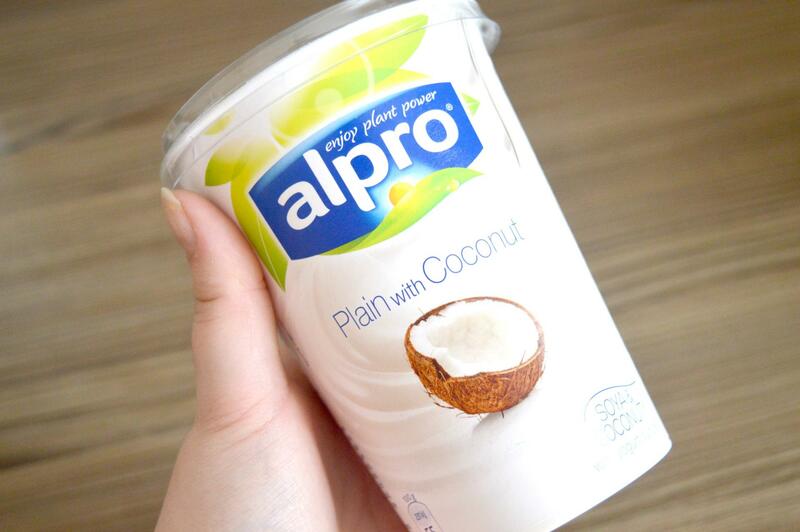 So onto the first product I received, the Alpro Plain with Coconut Yoghurt alternative. This stuff is a plant-based coconut yogurt which is super silky and tastes just like normal yoghurt. 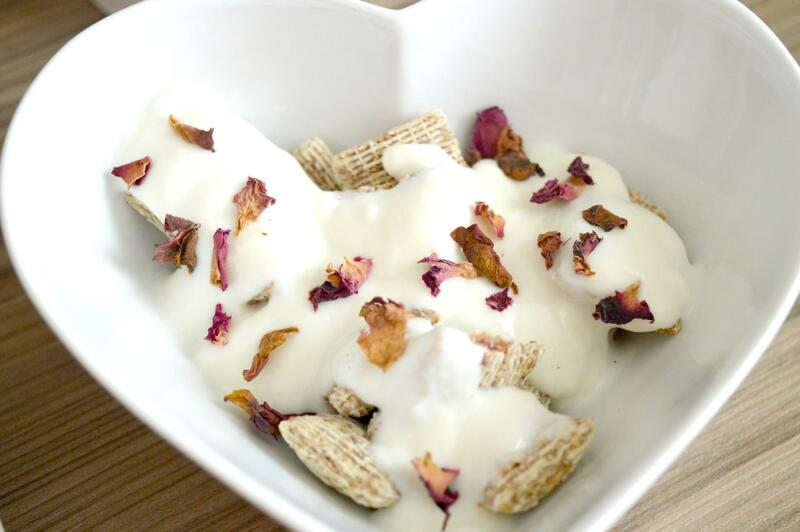 It has a great coconut flavour which gives the yogurt a lovely tropical feel. In terms of sweetness, it is definitely sweeter than the Alpro drink I tried but it isn’t too sickly. I’ve tried this on top of my cereal, Jordans Simply Granola and teamed up with fresh fruit. Either way, it is lovely. In terms of calories, it works out at 55 calories per 100g. The only thing slightly different to this in comparison to “normal” yogurt is the colour. It has a slight beige look about it but this in no way affects the taste. The second product I received was the Alpro Coconut Original Drink from the Alpro Coconut Range. This is a great creamy alternative to cow’s milk that is a blend of coconut and rice. The drink is great for pouring over cereal. The milk type drink isn’t very sweet but Alpro does state that it contains no added sugar, it only contains naturally occurring sugars. Instead of being sweet, it is very creamy and refreshing. It has a nice coconut flavour but it isn’t too strong at the same time. As for calories, a 100ml glass works out at just 20 calories which I found very surprising. 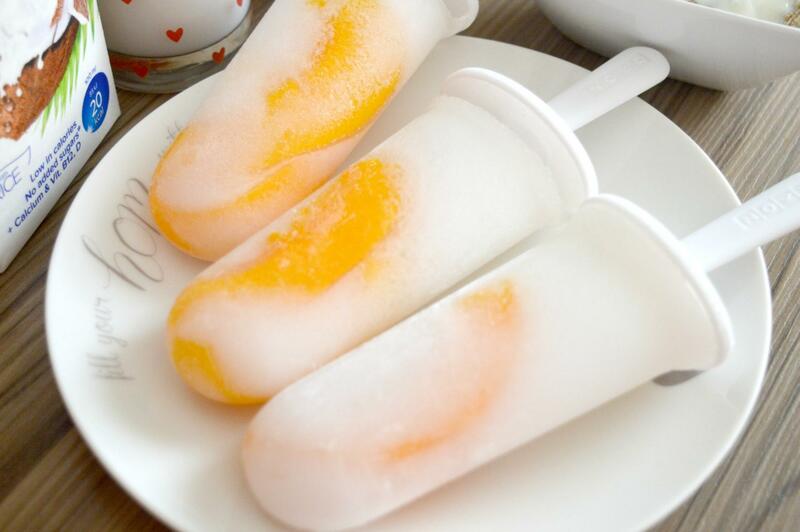 Oh and did I mentioned that it works fantastically well for making your own ice lollies? Taking Alpro’s Fruity Popsicle recipe as inspiration I tried out my own stripped back recipe. I added 400ml of Alpro Coconut Original, a tin of peaches and a spoon of icing sugar. I poured into moulds that Alpro very kindly provided me with. Then I popped them into the freezer overnight. By morning they were nice and frozen. I managed to make six lollies from the mixture with each working out at roughly 42 calories, ideal if you’re on a calorie controlled diet or looking for a nice refreshing snack that isn’t extremely unhealthy. Another way I plan on using the coconut drink is in a berry smoothie. I think the creaminess of the milk and the tropical flavour of the coconut would work fantastically well, especially now that it is Summer. I’m also keen to try it teamed up with some Choc Shot, a concentrated chocolate sauce made of 100% natural fruit syrup. All in all, I’ve got to say, I’ve been impressed by the Alpro Coconut Range. Both products I tried were tasty and delicious. 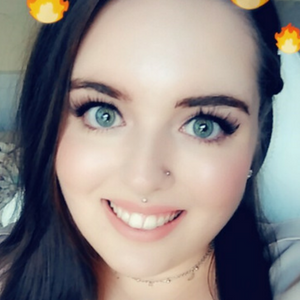 If you are a lover of coconut or someone wanting to try out some new products to get you in the Summer mood, I definitely recommend checking these out. In terms of price a tub of the yogurt alternative retails at £1.80 for 500g and the milk drink retails at £1.80 for 1 litre. 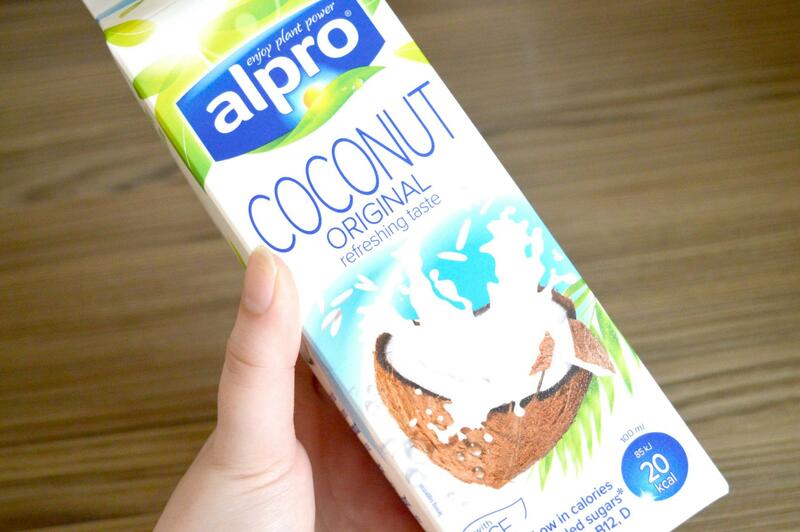 Have you tried any products from the Alpro Coconut Range? These products were sent to me for consideration. All thoughts, views and opinions are 100% my own and have not been influenced by any brand, company or individual. Please note this post also contains affiliate links.